Tom Petty was born today in 1950 in Gainesville, Florida. 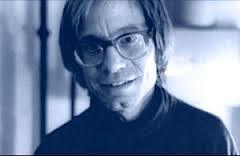 He died suddenly earlier this month at home in Los Angeles. Like countless rock ‘n’ roll fans of my generation, I loved the music of Tom Petty and the Heartbreakers from the first notes I heard. I saw the band perform countless times in every decade they worked, from an early band show at the Santa Cruz Civic Auditorium, to an intimate gig at McCabe’s Guitar Shop, where Petty and guitarist Mike Campbell sat in with J.J. Cale. The Heartbreakers and their leader made it look easy, in the way that only musicians who are of one mind do: The mastery of their musicianship and its intensity, particularly over the three nights I saw them during their historic Fillmore run, remains burned in my consciousness. When I call up the memory, I can feel the room levitate as it did each night during “Runnin’ Down A Dream.” Not every concert is like that. This month’s column is dedicated to the music and memory of Tom Petty with a focus on his quiet work as a philanthropist, and not so quiet work as a rock ‘n’ roll giant. READ THE WHOLE ARTICLE at Tourworthy. Read the entire remembrance at Down With Tyranny! Rubin “Hurricane” Carter passed away on Easter Sunday at the age of 76. 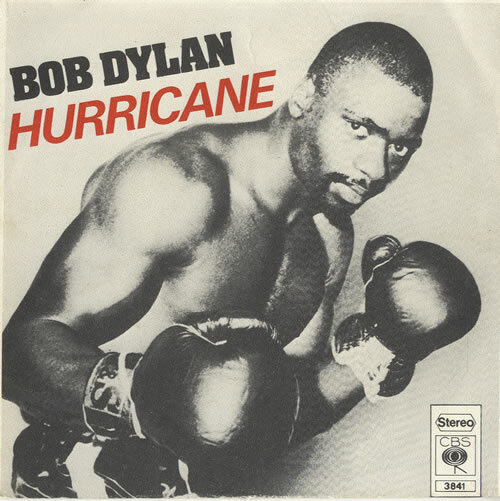 “Hurricane” was Bob Dylan’s protest song concerning the story of the middleweight boxer and the flawed judicial process that sent him away for an unjust term. The recording was a landmark: Over eight minutes long, it was released at a time when the media perceived Dylan to have moved away from topical subjects and protest songs; moreover, the song played a contributing role in Carter’s case to have his sentence overturned. Here was clear-cut evidence of music attempting to forge change actually doing so. 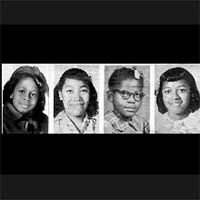 As a listener, the song forever changed me: I will never forget the moment I heard the song on the radio, its content crashing with my understanding of the American judicial system, the clarity of the message and the dissonance it created so upending to me as a young person, I froze. For many years, I could only refer to Dylan’s line from the song as a way to describe what I felt: “Couldn’t help but make me feel ashamed to live in a land where justice is a game.” Not knowing what to do or say or think about these matters, without access to organizations for change or discussion about it, “Hurricane” would become why I would write about music with meaning, though I would not know that for many years to come. While Dylan’s late ’60s and early ’70s performances were scarce and scarcely political, his albums Self Portrait and New Morning were the personal reflections of a more inwardly directed songwriter. Though he stepped out with the Band for Planet Waves and a tour in a new era of big-time rock ‘n’ roll concert business, he retreated again, against the backdrop of a marital disintegration that famously produced Blood on the Tracks in 1975. By summer of that year, he was ready to come out again, swinging. Speaking to criminal injustice, Dylan took on the plight of Rubin “Hurricane” Carter, serving time on a triple murder conviction in a New Jersey state prison. Impressed with Carter’s book, The Sixteenth Round, in which the boxer outlined his history as a vocal supporter of black rights and his framing by New Jersey law enforcement, Dylan was moved to visit him on the inside. As the story goes, following a five- or six-hour talk with Carter, Dylan set about writing a tribute with Jacques Levy, his collaborator at the time. This photo is a re-recreation of Dylan’s prison visit to Carter. “Hurricane” transcends simple topical protest song. Broadcasting as clearly as pistol shots in that New Jersey night, Dylan sets the scene and creates a detailed picture of a world unfamiliar to the majority of his listenership—many of them now younger than his original folk peers, and for the most part unacquainted with the political world, much less the combustible state of race relations in Patterson, New Jersey, circa 1966. Certainly the name Rubin Carter would be remembered in boxing and prison justice activism even if his story had not been the subject of a Dylan song. Yet the song comes by special stature, not only for increasing awareness among rock fans of the shortcomings of a criminal justice system in need of reform, but for reinforcing a perennially misunderstood concept: All human life is of equal value, no matter a person’s race, class or crime–real or imagined. 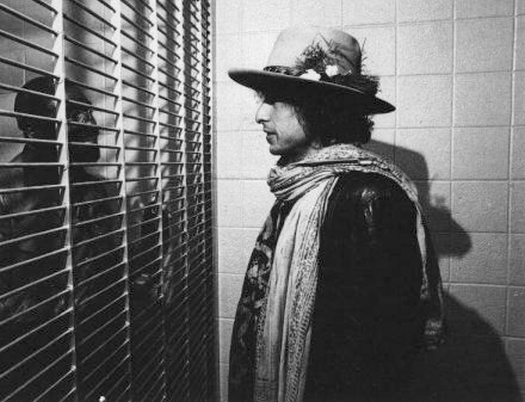 During his 1975-’76 Rolling Thunder Revue, Dylan and friends performed “Hurricane” onstage every night. 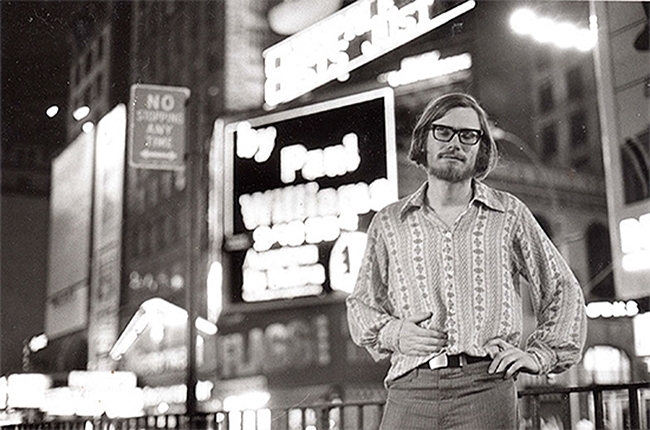 The entourage, including Allen Ginsberg, Joan Baez, Joni Mitchell, T Bone Burnett, Bob Neuwirth, and Ramblin’ Jack Elliott, rolled into Madison Square Garden in December of 1975. They were joined that evening by singer Roberta Flack and boxer Muhammad Ali for a benefit billed as “The Night of the Hurricane.” Ali addressed the crowd playfully, in characteristic rhyme. “I’m so glad to see you all with the cause because you have the connection with the complexion to get the protection,” he said from the stage. The song’s intensity, a unity of frantic fiddle and verse, stirs feelings of empathy and compassion; it becomes a companion for believers in the cause to free Rubin Carter, as well as others wrongly imprisoned behind false testimonies and racial bias. 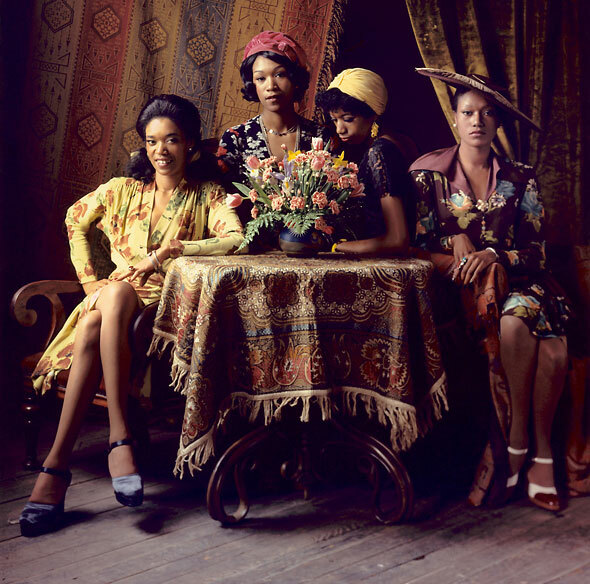 Following the release of the song as a single in 1975 and the formation of a grassroots movement for Carter’s freedom based on the false evidence used to convict him, the boxer was released on bail and granted a new trial the following year. His conviction was finally overturned in 1988. Eventually all charges against Carter were dropped and he was exonerated; Carter went on to become an activist for falsely accused prisoners. Richie Havens, a frequent interpreter of Dylan’s songs who opens all his shows with “All Along the Watchtower” (to name just one of Dylan’s pointed “post-protest” era tunes), says that “Hurricane” remains his favorite among all of Dylan’s songs. “That was an incredible job of going in there and winning, getting him out of there. Unbelievable,” Havens told me in 2008. “Hurricane” is my favorite song by Dylan too: It spoke to matters for me that as a young person in 1975, I had little experience with, and yet I felt the truth in the lines, especially the one about the criminals in their coats and ties and how they put the wrong man behind bars. I couldn’t wait for the song to come on the radio so I could stop whatever I was doing for an entire eight minutes and be transported, away from whatever real or imagined injustice was happening in my own adolescent world. Dylan’s exciting “return” to protest was my first meaningful engagement with a protest song. Though it took many years for me to unpack its importance to who I am personally and professionally, it was this song that set me in a direction for further discovery of folk and story songs, topical singing, freedom movement, liberation, and message music, the kind that holds secret, hidden histories of ourselves and our country that you won’t often find written about in history text books; rather these relevancies to American social, political and cultural history are handed down in oral tradition, read in books like Carter’s and heard in Bob Dylan’s songs. a version of this originally published on May 24, 2011 in Crawdaddy! 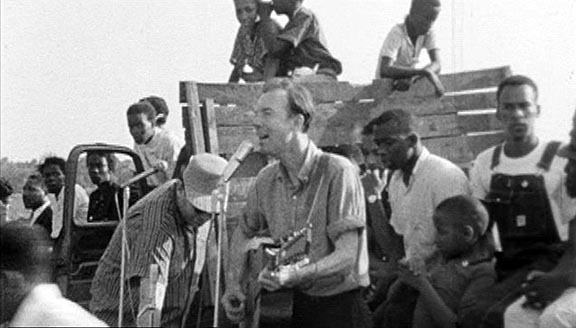 The folksinger, activist, songcatcher, banjo-picker, environmentalist, family man and non-violent resistor Pete Seeger was inspiration and forbear to any man or woman who uses their songs for economic and social justice—and doesn’t ever stop. Persecuted for his beliefs by federal law enforcement, the House Un-American Activities Committee and the public, he pressed on to become the greatest singing activist of our time. “These days my purpose is in trying to get people to realize that there may be no human race by the end of the century unless we find ways to talk to people we deeply disagree with,” Seeger told his biographer Alec Wilkinson, author of The Protest Singer. “Whether we cooperate from love or tolerance, it doesn’t much matter, but we must treat each other nonviolently.” Seeger will be an irreplaceable force on the protest scene, not only for his songs and actions, but for his pure belief in the promise that we shall overcome someday. “Never settle for the given. What is it that hasn’t been mentioned? 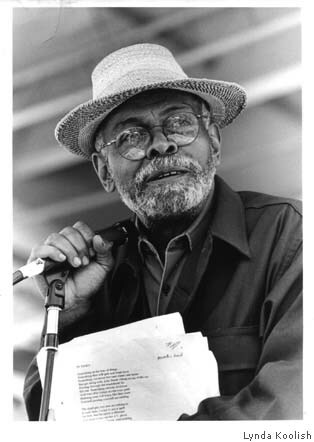 What is beyond that?” These are the words of activist, actor, poet, playwright, director, and music critic Amiri Baraka. He passed today in Newark, NJ at the age of 79. “Art is supposed to unlock you, make the world more available to you,” he said. It was the way he felt when he heard Thelonious Monk for the first time. I heard Baraka speak at the Hammer Museum in Los Angeles two years ago this month, in conversation with his daughter, Kellie Jones, curator of the wildly successful exhibit, Now Dig This! Art and Black Los Angeles 1960—1980, discussing art and family, though the conversation inevitably turned to Baraka’s recurrent theme, surviving America. “Do you understand the world?…What do you think?… What is important to you?…What is it you want to say?…How do you say what the world is?…How do you tell us who lives on this planet?…How do you make something speak to the world?…” These are the questions he asked of himself and of other artists, for over 50 years. Born Everett Leroy Jones in 1934 in Newark, NJ, where he lived until the end, he changed his name to LeRoi and chronicled the birth of free jazz as a journalist; he wrote an Obie award-winning play, The Dutchman, and he is the author of Blues People, one of the first books to make connections between music and social history. Equally informed by the poetry of Langston Hughes, the politics of Malcolm X and the Black Mountain College poets, Allen Ginsberg and the Beat movement, in the mid-‘60s, Baraka founded the Black Arts Repertory Theater/School (BARTS) in Harlem which contributed to the development of a new, unapologetically black style of writing, its creation dovetailing with the Black Power movement’s cultural agenda. By the late ’60s he’d changed his name to Baraka; his album It’s Nation Time—African Visionary Music, for Motown’s Black Forum label, features his Black Nationalist poetry set to music. Stirring it up for 50 years, in 2002, Baraka was named Poet Laureate of New Jersey and of the Newark Public Schools amidst controversy over his poem, “Somebody Blew Up America” (who? who? who?). That same year, The Roots accompanied him on “Something in the Way of Things (In Town),” on their album, Phrenology. Condolences to the surviving members of the Jones and Baraka families. In the ‘90s, Williams revived Crawdaddy! briefly as a newsletter; compiled by hand and from the heart, much the way he started it, his close-knit and handcrafted care contributed to Crawdaddy! maintaining its cachet through the years. It was in his middle period, of attending Bob Dylan concerts that I became acquainted with Williams while I was attempting to get my own career as a music writer up and running. He encouraged me to write my first book and introduced me to my first publisher. Williams was the closest person I had as a mentor among rock writers, though how I ended up writing for the online edition of Crawdaddy! from 2007-2011 was not related to our acquaintance. By that time, Williams had sold the rights to his magazine to an entity known as Wolfgang’s Vault and they hired me as a contributor there where it was my privilege to interview a crazy-long list of rock legends who gave me access largely based on the reputation of the magazine produced by Williams. 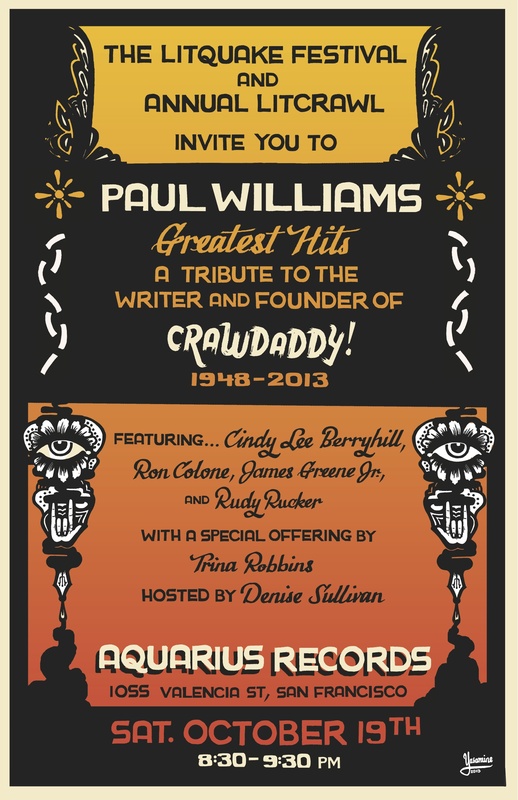 Richie Havens, Yoko Ono, Van Dyke Parks, Eddie Kramer, Janis Ian, and John Sinclair, among others, all remembered how Crawdaddy! contributed to shaping the culture of music fan journalism, and all were happy to give back what Williams had so freely given to them with his magazine and with his words.